Shellharbour Seabird is a new luxury three bedroom home perfectly positioned in picturesque Shellharbour Village with all the comforts you would expect from a luxury holiday house. Sleeping upto 8 people the main bedroom offers an ensuite, balcony and king size bed. Bedrooms 2 and 3 have a double bunk bed with single above. All bedrooms have LED televisions. The kitchen area sprawls out onto a stunning outdoor balcony. Enjoy a BBQ or just relax and read a book. 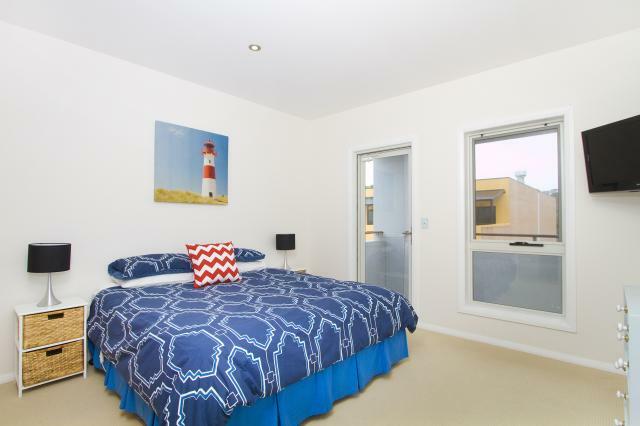 Shellharbour Seabird is situated in the perfect location, just 150m from the water's edge and less than 50 metres from Shellharbour's main restaurant strip, making it ideal for a summer getaway with family and/or friends. Spend your time wandering down to the sandy beach, the boat harbour or just sit back and relax and enjoy the view! Excellent restaurants and shops are a stone's throw away! Fully self contained 3 bedroom house. Main bedroom king size bed, bedroom 2 & 3 have a double bunk bed with single above. Modern kitchen, lounge, entertaining balcony with views to the ocean, BBQ. 50% of the booking fee will be charged if cancellations is made. Variations to any booking resulting in less days than booked will be non-refundable. A variation of the Booking which reduces the number of nights stay will be a treated as a cancellation of the Booking in respect of those nights. We have a minimum nights stay policy of 2 nights. No refund will be made for a variation to the extent that it breaches our minimum nights stay policy. A bond payment of $1000 is required within 14 days of arrival. It will be credited to your designated payment method once our property has been inspected and deemed left in a similar state to your arrival. We agree to ensure this occurs within 7 working days of your departure. - "Booking" means the period for which you have paid to stay at the Property. - "Property" means [add your name and address of your property] and all its fixtures fittings and equipment. - "Management" means the owners and managers of the Property. - "Guests" means the persons who stay overnight in the Property during the Booking. - "Visitor" means a person a Guest permits to visit the Property during the Booking. - Payment for the accommodation constitutes acceptance of these Terms and Conditions. - Check-in time is not before 2pm on the arrival date and check out time is not later than 10am on departure date. - Late departure is subject to prior arrangement and availability and extra charges will apply. - You must notify Management of expected arrival time and a mobile contact number at least 2days before arrival. - Check-in/check-out will be with security keypad door lock unless special arrangements have been made prior to arrival. - To be received within 24 hours after the Booking is taken by Management. Bookings are not confirmed unless and until this payment is received. - Please ensure payments are made within the specified time limits or the Booking will be cancelled automatically without notice or liability to you. - A bond payment of $1000 is required at the same time as the outstanding balance of your Booking. It will be credited to your designated payment method once our property has been inspected and deemed left in a similar state to your arrival. We agree to ensure this occurs within 7 working days of your departure. - Any damage loss or expense incurred by Management as a result of your breach of these Terms & Conditions will be charged against the credit card. Examples include but are not limited to any breakage damage or excess cleaning requirements extra Guests or Visitors beyond those declared. - If the Property becomes unavailable for your occupancy due to unforeseen circumstances (eg. fire storm damage etc) then Management will inform you immediately and endeavour to obtain suitable alternative accommodation for your occupancy; failing which any moneys paid will be refunded in full. 7. PARTIES & FUNCTIONS - Either Parties and Functions are strictly prohibited. - Breach of this condition may result in immediate termination and eviction without refund and extra charges for security cleaning garbage removal wear and tear repairs etc. - We supply linen pillows blankets and towels which must be left where supplied in the bedrooms or bath room on departure. Further linen may be hired through Management. Beach towels are not included. - You must comply with all applicable Rules and all instructions from Management and the caretakers of the Property concerning occupancy property health safety and quiet enjoyment of the Property and our neighbours. - You are responsible for damage breakages theft and loss of the Property and any part of it during your stay. You must notify us of this immediately. Management may recover from you repair or replacement cost (at Management's discretion) - Only the guests nominated and agreed in the Booking may stay in the Property over night. If any other guests stay extra charges may apply or the agreement may be terminated without refund. - Disturbance to our neighbours including excessive noise is prohibited and may result in termination and eviction without refund and extra charges may be made for security and other expenses. - Before departure all food must be removed from fridges all rubbish put in the appropriate council rubbish bins provided and crockery and cutlery washed and packed away. The Property must be left in a clean and tidy condition. - The property should be vacated on time and secured. All windows and doors are to be locked. - In the case of any problem or complaint you must inform Management at the earliest opportunity so Management has the chance to rectify the situation as quickly and efficiently as possible. You must allow repair/service access to the property during reasonable hours. - Any complaint which cannot be resolved locally must be notified in writing to Management prior to departure from the Property. - Failure to follow this procedure this may hinder the ability of Management to rectify the problem or complaint and reduce or extinguish any claim you may have. We recommend all guests purchase travel insurance since Management are not responsible for any injuries illness or accidents that may occur whilst staying at our property.